Xiaohong Wang, a molecular biologist with the Agricultural Research Service (ARS), a division of the Department of Agriculture, in Ithaca, New York developed a new process for determining the type of potato cyst nematode infecting potato crops. Wang’s process is described in a paper that appeared earlier this year in the European Journal of Plant Pathology. She has also applied for a patent on the process. There are two types of potato cyst nematode (PCN), the golden nematode and the pale cyst nematode. Telling one PCN from the other is important because breeders have developed potatoes that can resist the golden nematode, but have yet to develop varieties that resist the pale cyst nematode. 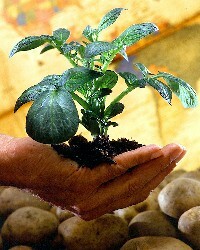 If the pale cyst nematode is found in a field, potatoes cannot be grown there. Conventional methods of determining the type of PCN encountered in a potato field require large samples of nematode cysts and time consuming analysis of their DNA using polymerase chain reaction assays. Wang and her colleagues have developed a way to distinguish between the two species of PCN that uses a new genetic marker and is more sensitive and reliable. The system developed by Wang is capable of testing much smaller samples of cyst material, as small as one cyst, according to Wang. Wang and colleagues developed their test by cloning the parasitism gene that nematodes use to produce an enzyme, chorismate mutase, that plays an important role in nematode infection. The researchers then sequenced those chorismate mutase genes, compared the sequences, and identified unique regions in each sequence.